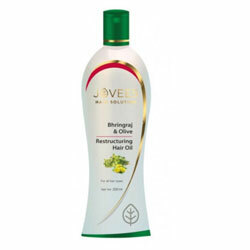 Hair oil deeply penetrates to help repair, seal and smooth even the most damaged hair. Jovees intensive restructuring hair oil deeply penetrates to help repair, seal and smooth even the most damaged hair. Using the power of pure plant oils along with other precious herbal extracts that help to restore volume, health, silkiness and shine. Its therapeutic properties help to reactivate dead follicles by stimulating the generation of natural protein and help in controlling hair fall and premature greying. Rub sufficient quantity depending on the size of the hair into scalp with finger tips. Massage gently for 2-3 minutes. Preferably apply the night before washing the hair. Use twice a week. Bhringraj oil ext., Olive oil, Jojoba oil, Henna Quinoa protein.